I’m not really feeling like getting back to the site, but an Epilogue seemed like a good place to restart. Honestly, (What a stupid crutch phrase. As if I’ve been dishonest until I state, “Honestly.”) I always struggle with restarting. Where do I begin? For your attention!! 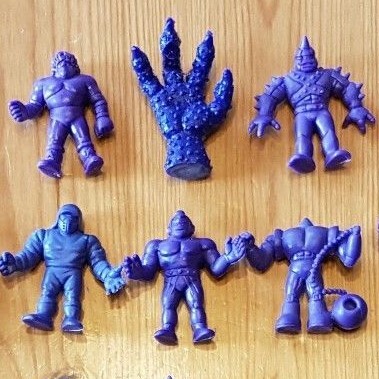 The purple claw shown at the top of this assortment is a bootleg copy and thus not an official M.U.S.C.L.E figure! It was just part of what I had and included it. It is not a Class A, I don’t want to cause any confusion and apologies if it does. He was totally trying to pull a scam earlier. No question. Once he was caught, I respect that he came clean about it. That made me happy. Something else made me very, very sad. When I saw Chuck’s comment it felt weird, but I let it go. It didn’t sound like my friend Chuck, but did it really matter? Then I learned that Glimpse617 was the high bidder in an auction that had a Purple #153 4-pack sell for $580. Suddenly the weird feedback I pointed out in AW #245 popped into my mind. I decided to take a look at current listings from arforbes algigli0, and guess what I saw? Another Purple #153 4-pack and another miracle lot (with another Purple #107). I decided to contact my friend Chuck. When I asked him if he wrote the comment, do you know what he said? I decided I should do a little digging. It wasn’t difficult. The email address was not what Chuck used in the past on the site. Chuck has never posted as “Chuck.” Only as Zero. Weird. Chuck lives in Ohio. The IP Address (72.222.195.154) is located in Phoenix, Arizona through Cox Communications. Who lives in Phoenix, Arizona and uses Cox Communications? Why go through all that trouble? Why lie? Why continue to lie? I think most simple answer is that he is a perpetual liar. Anything more than that, I don’t want to guess because everything I can imagine makes me feel very, very sad and disappointed. I have something happy to wrap-up my ramblings thanks to Mike_The_Muss. He contacted me with a auction picture. Would you be happy if you bought this lot? There wasn’t anything that jumped out at me. I should have been paying closer attention. Did you see it? How awesome is that?!?! I don’t know if Mike wants me to share the sale price, but I felt it was pretty average for a lot of that size. It’s a bummer that it is missing that head, but that is easily correctable. I don’t even mind the missing fingers. Since Mike got it for a steal, I wonder what collectors would pay for a headless SHA figure in an auction? Specifically one with damage to the fingers. I think it will be less than the most recent $697, but would it be close to the $305 of the last headless SHA? I’m not sure, but I’d love to see it come up for auction. With a honest, trusted seller, like Mike, I can even imagine it going past $305. Let’s take a look at the eBay garbage heap. – The $99 BIN has dropped to $60, but I still wouldn’t want a second set. – “…a small sample of this rare collectable.” So dumb. 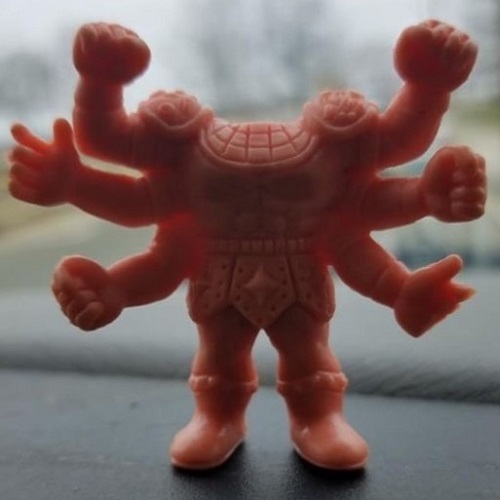 – First time I’ve seen single figure listings of the new M.U.S.C.L.E. figures. – Posters should only be sold as auctions starting at $0.99. – Counting is for nerds. 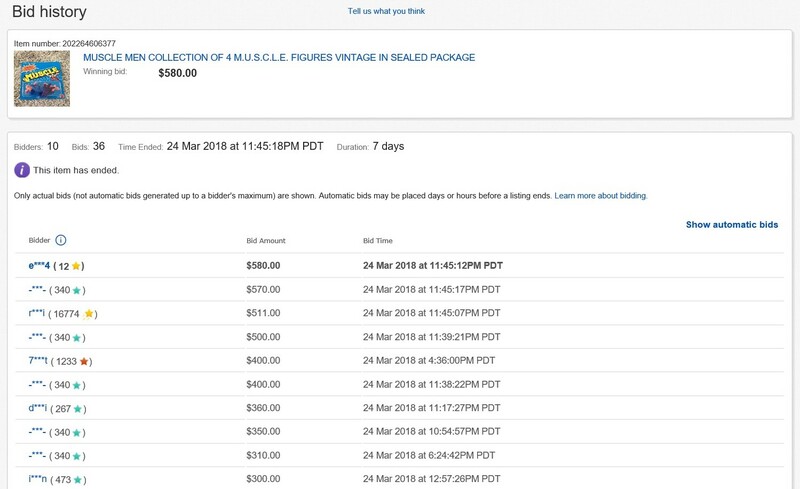 – Why did this lot pass $1 per figure? – $15.95 BIN plus $3.25 shipping. Guess the lot. Normally I mindlessly skip over these figures, but the $25 price tag stopped me in my tracks. Not because of the price, but how had I not talked about it before?!?! 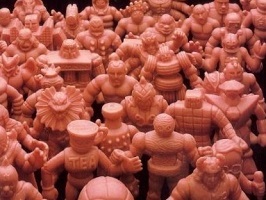 vintage 1980’s pink toned original M.U.S.C.L.E MEN made by Mattel all are mint condition, kept in dark, temperature controlled environment in sealed bags, mint condition not some beat up pieces of crap some kid blew up with a fire cracker,or melted with a magnifying glass, or passed through the digestive system of the family dog, they are mint examples and ready for display, each one comes in its own plastic crack bag sealed. I have priced these accordingly but not ridiculously, I don’t care what the peanut gallery has to say or the local M.U.S.C.L.E MEN SOCIALIST PEOPLES CO-OPERATIVE LED BY GET THIS PEOPLE THE MASTER M.U.S.C.L.E MEN ARANGMENT COLLECTOR OR COMISAR WHATEVER! I bolded my favorite part. It made me laugh like it was a punchline. What do you think someone thinks when they read that capitalized last part? Besides crazy, I always have the same impression when I read rage typing like above. I imagine someone beating off, accidentally hitting Caps Lock, but still trying to type. That’s why it’s basically coherent, but still riddled with problems. This entry was posted on Friday, March 30th, 2018 and is filed under UofM News. You can follow any responses to this entry through RSS 2.0. You can skip to the end and leave a response. Pinging is currently not allowed. Alex is getting desperate for money and/or attention. This kind of action just smells of some kind of desperation.